I have always loved pickled beets. It is a love that I have passed to my children. My boys will eat pickled beets either until I put the jar away or they are all gone! 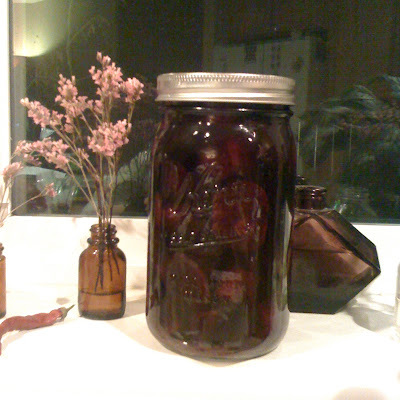 So, I was delighted when I found, by taste-test, that my mother in law pickles the best beets. And as always, was willing to share her recipe. Here you go. Chop the ends off the beets. I like little beets that you can boil and pickle whole, but if they're big, then feel free to cut them in half, or even quarters, basically a big bite sized piece. 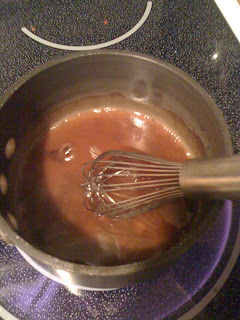 Put them into a pan of cold water and bring to a boil, and boil until tender. Place all the remaining ingredients in a saucepan and bring to a boil. Put the beets into a quart jar, then pour the liquid on top. Then put a lid on. Keep in the fridge and try to control yourself as long as you can. When you finally crack that jar and eat them, you're going to be glad you waited. I bought more beets yesterday, thanks for posting this recipe, can't wait to try it! Does your Mom-in-law ever put eggs in the jar too?